Ideal for grading, leveling, spreading topsoil, removing stones as well as maintaining ball diamonds and horse exercise arenas. 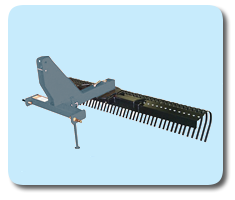 All units utilize 5/16” x 1” x 15” heat treated spring steel tines which are individually bolted to the tine bar and supported by a “waffle plate” for added strength. LRHD series will fit a Cat. I quick hitch and are supplied with a parking stand. All models are shipped with 7/8” lift pins. View our literature.